German sculptor. He came to Berlin in October 1827 and trained in the studio of Christian Daniel Rauch who influenced him greatly for many years, and at the Knigliche Akademie der Knste. In early works such as the marble relief based on Goethes Fifth Roman Elegy (1832; Heidelberg, private collection) and the marble and bronze group Nymph Catching a Butterfly (1837-9; Luxembourg, Palais Grand-Ducal) he shows his preference for themes that connect him with ancient art and the German art of the 16th century. The style of these works is, to a large extent, drawn from works by Rauch, although Drake lent his portrayals a genre character and softened classical strictness with gentler modelling and an emphasis on expression. In the field of architectural sculpture he was content to stay within accepted architectonic limits, for example in the group of eight figures on the Schlossbrcke in Berlin (1842-53; in situ) and the tympanum on the Neues Museum (1854; largely destroyed). In the allegorical figures of the eight provinces in the White Hall of the Berlin Stadtschloss (1844; destroyed), adaptation to the Baroque surrounds is restricted to the diagonal composition and a lively draping of the figures, while the figures on the Thesentr of Wittenberg Cathedral are based on Florentine sculpture of the 15th century. Numerous honours at home and abroad testify to the esteem in which Drake was held in hid day. His most famous work was probably the bronze Victoria on the Berlin Victory Column, unveiled in 1873. 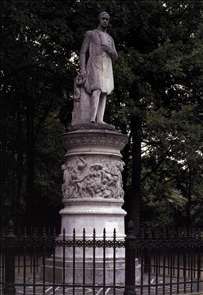 See more details about "Monument to King Frederick William III of Prussia"